Add some macho charm to your keys with this quirky personalised moustache keyring. Made with designer acrylic, the black acrylic shape looks great attached to any set of house or car keys. 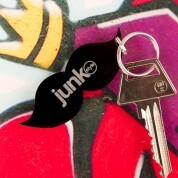 Personalised with the name of your choice, it is a great accessory to make sure keys don't get lost or mixed up! 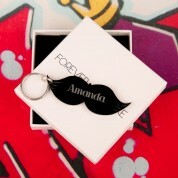 The keyring is presented in a velvet lined presentation box, perfect as a quirky gift for a loved one.